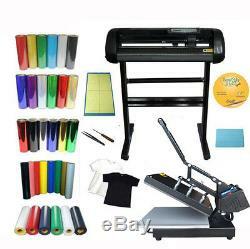 Plotter & 15x15 Heat Press & Vinyls KIT. Is now the most popular heat press material. Vinyls can be cut by. To print name, number, logo and design on. At last, press the image on T-shirt or other fabric products. Heat transfer vinyl is perfect for substrates transfer, this package have 5 kinds of transfer vinyls for you try. And We will provide a detailed Potter Instruction and all-sided technique Support. 24inch ASC365 500g Cutting Plotter. This Plotter have 500g cutting pressure, can cut sticker and decal. Masking film for painting or etching, vinyl lettering, decorative. Dark/light transfer paper , as well as all kinds of T-shirt heat transfer media like. PU vinyl , flock, colored paper for garments. We supply technique support after your purchasing. And we provide a detailed user manual with words, pictures and video made by ourselves, after your ordering, we will send it out with the cutter machine. With a cutting mat , this cutter can be used as a flatbed plotter to cut single layer materials, all the details information , please see our user manual. High strength aluminium alloying structure, streamlined design, beautifully and gracefully. Unique cutting blade soft landing function, cutting thinker material more easily. Luxurious push and pull vinyl basket, convenient for practical operation. With USB high speed interface, supporting plug in and off when power is on, PNP. Imported thin film controlling panel with nine keys, easy to operate. Relative humidity:(30%-50%)without condensation. High quality for commercial application. Economical, yet perfect for applying all types of transfers including foils, sublimation, ink jet and more. Plate size: 15" x 15" (38 x 38 cm). 1 Yard PU Vinyl from 33 Colors. PU vinyl transfer is now the most popular heat press material. PU vinyl can be cut by. 1 Yard PET Laser Vinyl. It is applicable for various textile fabrics. Don't be restricted by color printing with strong covering power, especially for sports, LOGO, single picture, clothing, textile fabrics, leather products, luggage &bags, paper products, Oxford cloth, non-woven fabric and so on. Product origin: South Korea Width: 19.29(49CM). Suitable for all kinds of fabric materials, not restricted by the colors of printed material, covering sthength is strong, it has a wide range of application, suitable for printing of sportswear, LOGO, single color pattern, garment accessories, etc. Also can be used for textile material, leather products, luggage products, paper, polyester oxford, non-woven fabrics, such as T-shirt, shirt, jeans, sportswear, pillow, car seat covers, headrest, window curtain, etc. Country of Origin: South Korea Width: 19.69(50CM). White, Yellow, Red, Blue, Green, Black. 1 Yard PET Metal Light Vinyl. Country of Origin: South Korea Width: 19.29(49CM). Silver, Gold, Red, Blue, Green, Black. Color: Black, white, yellow, red. Sure Cuts A Lot V3. 1 light color T-shirts 002087. 1 dark color T-shirts 002086. 1 Vinyl Weeding Tool-Tweezer (005101). 1 Vinyl Weeding Tool-Drill 005102. 1 24 500g Cutter Plotter 1 set. 2 15x15 Heat Press 1 set (110200). Sure Cuts A Lot V3 Cut Vinyl Cutter Software (004080). 1 Square Vinyl Scraper 7.9x12.6cm (019032). 11 1 Vinyl Weeding Tool-Tweezer(005101). 12 1 Vinyl Weeding Tool-Drill(005102). 13 1 sheet A3 ASC365 Cutting Mat (004026). Instruction of Vinyl Heat Transfer. 1 Make target design by computers. Switch on the cutting plotter and better try the pressure of tool in the first step: After cutting, the color layer as well as one layer of base paper can be easily removed at the same time. 2 The tool should just cut half thickness of the base paper. 3We have kinds of transfer vinyl for your choice. 4Set the speed according to the size of the design. For example, set the speed faster (at 50-75) for a large design, and at 25definitely for a small one. Lowerspeed cutting is very important! 5Peel off the unwanted color layer part when finis cutting. 6The design on base paper should be complete without any deletion. If you peel the wanted parts , you can press it back then continue. 7Press by heat press, Set the temperature at 150-175(310F-350F) and the time at 10s -15s. The temperature & time is not absolute, You should adjust on actual status. Set the temperature at 150-175(310F-350F). 9Cool peel the base paper. 10A wanted design will be on your unique T-shirt completely. Orders are processed from Monday-Friday; Not on the weekends & public holidays. Payments via eCheck do not clear immediately. Usually you will wait 5-7 days after checkout for it to clear. The item "24 Cutter Plotter 15x15 Heat Press T-shirt Heat Transfer Vinyl Weeding Tool KIT" is in sale since Wednesday, September 10, 2014. This item is in the category "Business & Industrial\Printing & Graphic Arts\Screen & Specialty Printing\Heat Transfer\Presses". The seller is "asc365usa" and is located in El Monte, California.